Here is news on Assemblyman Dinowitz fighting against single payment fees levied by Verizon. I agree with his logic that it targets the poor and middle class unfairly, who are struggle to pay their bills on time. Why would you pay an extra $2 to pay by phone, unless you were at risk of losing your service which costs $15 to restore? The next logical question would be; if government does not allow payment to influence the cost of a service in the private sector, why should cash customers pay more when going over public bridges or tunnels such as the George Washington Bridge and both the Lincoln and Holland Tunnel. I understand the “commuter discount” but why should EZ Pass customers pay $7.50 or $9.50, depending on the time of day, for a single pass over the bridge, when CASH customers pay a whopping $12 per trip no matter what time of day it is? That’s almost a 40% penalty against cash users. Why are cash customers being penalized in our society? What if I don’t want the government monitoring every time I go over a bridge or through a tunnel? What if I don’t have the credit or extra cash to deposit into an EZ Pass account? For me, this is a clear cut civil liberties issue. We transformed a society that openly discriminated according to race to a society that discriminates according to wealth or access to credit. Unfortunately, race still often has an effect on wealth or access to credit so; have we really progressed as a society or just come up with a new means to discriminate? Is anyone with me on this? Amercian consumers need to take back some control. It’s not enough to pay anymore, now big government and big business want to dictate how we pay. I hope the Assemblyman is successful and I hope similar campaigns are started against these assaults by big business AND big government to eliminate all cash in our society. Assembly Consumer Affairs and Protection Committee Chair Jeffrey Dinowitz announced his opposition to Verizon Wireless charging single payment fees to consumers who pay their bills online or over the phone each billing cycle as opposed to enrolling in automatic bill pay. Single payment fees generate numerous complaints and inquiries from customers because they unfairly target low-income consumers. He called on Verizon to reverse the $2 fee Verizon intends to impose on some of its customers. “In 2011 we prohibited companies from charging additional fees to customers who pay their bills by mail. No company should charge some customers additional fees based on how they pay their bills. It just amazes me that, at a time when Verizon has already been harshly criticized for its efforts to cut back on the benefits of its workers, it would take additional steps that negatively impact on middle class and poor people. I hope Verizon takes back this bag-of-coal holiday present to its subscribers. Their bad timing is truly amazing,” stated Assemblyman Dinowitz. Labels: "Cash vs Credit", "Consumer Affairs", "George Washington Bridge", "Jeffrey Dinowitz", "Lincoln Tunnel" "Holland Tunnel", "Toll Hikes", "Verizon Wireless"
Here is news on local transportation issues related to Koppell's district. Council Member Oliver Koppell announced that, at his request, the Department of Transportation (DOT) is making a number of changes and improvements in the district that will provide greater safety and convenience for his constituents. Among these, is the extension of the school bus loading and unloading zone on the south side of West 236th Street between Douglas and Independence Avenues. An increase in the number of students arriving and departing from PS 24 and MS/HS 141 at the same time requires space for additional buses to load and unload in order to relieve crowding. The DOT agreed to extend the No Standing 7 A.M to 4 PM School Days signage 40 feet to accommodate the extra buses. Also, at Koppell’s request, the DOT agreed to install two bus shelters to provide seating for riders and protect them from inclement weather. A new bus shelter will be installed on the southwest corner of Bedford Park Boulevard and Jerome Avenue and the second is currently being reinstalled on the southeast corner of Paul Avenue and West 205th Street. Additionally, Koppell was successful in convincing DOT to remove the No Parking 7AM to 7 PM Monday thru Friday signage on Exterior Street, where the parking prohibition is hurting business and which is no longer needed. Lastly, the large potholes on the Henry Hudson Parkway service road between West 231st and West 232nd Streets, that Koppell asked to be repaired, were fixed at the beginning of November. “I am grateful that DOT has responded to the needs of my district and is taking the steps necessary to improve conditions for residents in the area, Koppell said. Labels: "236th Street" "Independance Ave", "Bedford Park", "Bus Shelters", "DOT", "Koppell", "MS/HS 141", "PS 24"
Besides holding an estimated one trillion dollars of US debt, China also launched its first aircraft carrier recently. Another interesting fact is that it was supposedly sold to China by Russia for $20 million. http://www.euronews.net/ Satellite images have been published appearing to give a first glimpse of China's new maritime might. The aircraft carrier, China's first, is said to have been taking part in trials in the Yellow Sea. Beijing is seeking to boost its military power amid long-standing territorial disputes in the region. Labels: ""Russia", "China", "Euro News", "Maritime Might", "Varyag", "Yellow Sea"
I am not sure if the Bronx has its own Three Kings Celebration, but there is a Three Kings Celebration taking place just over the bridge in East Harlem. If any readers want to educate us about the holiday, please do send us an e-mail or make a comment. From the photos found on the flicker link posted below the event looks like a lot of fun. Celebrate Three Kings Day with El Museo Del Barrio as they commemorate the 35th Anniversary of their Three Kings Day Parade! Embrace this joyous occasion and parade with camels, music, colorful puppets, dancing, and parrandas. School groups, community organizations, and families are welcomed! Our favorite time of year is upon us! Join us as we celebrate the 35th Anniversary of our time-honored procession through the streets of El Barrio. Spirit and joy abound as we parade with camels, music, colorful puppets, dancing, and parrandas on this magical day. The parade route begins at 106th St. and Madison Ave. and ends at 115th St and Park Ave.
School Groups, Community Organizations, and families are encouraged to participate. Early registration is strongly suggested. ¡Nuestra temporada favorita ya está aquí! Te invitamos a celebrar el 35° aniversario de nuestra procesión por las calles de El Barrio. En este día mágico, la felicidad y espíritu nos rodea durante una procesión con camellos, burros, música, marionetas coloradas, baile, y parrandas. Grupos Escolares, Organizaciones Comunitarias, y familias están invitados a participar. Se sugiere confirmar su participación con anticipación. Labels: "colorful puppets", "dancing", "East Harlem", "El Barrio" live camels", "El Museo Del Barrio", "music", "Three Kings Day"
Just in case anyone missed the very informative Ali G interview of Newt Gingrich, I posted the YouTube Clip below. In the clip, Ali G and Republican Presidential hopeful Newt Gingrich discuss topics including welfare reform and the chances of a female candidate ever becoming President of the United States. Labels: "Ali G" "Newt Gingrich" "Speaker Gingrich" "Republicans running for President", "Female President of the United States", "Welfare Reforn"
If you are an immigrant with artistic talent please review the mentoring program available from NYFA. Deadline: January 31, 2012 at 11:59 p.m. The NYFA Mentoring Program for Immigrant Artists is offering a program that will pair emerging immigrant artists with artists from the NYFA fellowship program. The duration of the program is six months, spanning from April to September of 2012, and each mentee will be assigned one mentor. Mentors will both guide and expose mentees to the broader New York cultural community. Mentors will also help mentees in achieving a specific goal and objective. For application and more information, CLICK HERE! Labels: "Immigrant Artists", "NYFA Mentoring Program"
Here is news on NYC Comptroller Liu using pension fund deposits controlled by NYC, to help protect our environment and against discrimination in the work place. Another interesting fact is that our City has $34,600,191 invested in KBR Inc., which according to the press release sent is one of the largest defense contractors in the U.S. With approximately 50% of our Federal budget spent on defense, it’s safe to assume we all benefit from the arms industry even when these factories are in different states and we are not the ones making the planes, guns or bullet proof vests for our troops. Is this an industry we need to divest from to prevent dependence on our military industrial complex? With our mounting Federal deficit is our military power the only thing protecting the hegemony of the U.S .dollar? I am sure we would all love a piece of one of these lucrative contracts, until we have to send our children overseas to use the war products were financing the production of. Can anyone in the U.S. say we are not beneficiaries’ of military expenditures? Is Iran our next target? Has anyone else seen the footage of China's first aircraft carrier on recent news clips? NEW YORK, NY – Comptroller John C. Liu and the New York City Pension Funds said today that a shareowner resolution has led KBR Inc., one of the largest contractors to the U.S. Defense Department, to adopt a policy prohibiting workplace discrimination based on sexual orientation and gender identity. The New York City Pension Funds’ proposal received a 61.7 percent vote at KBR’s May 19 annual meeting, and the company’s board adopted it Nov. 29. In another notable success from the past year, the Comptroller’s office negotiated improved monitoring of the global companies that supply tech-giant Microsoft with hardware components. Following consultations, Microsoft took the unprecedented first step of requiring its suppliers to produce reports documenting their compliance with international standards on human and labor rights. In the coming year, the Funds plan to continue to proactively advance corporate governance and social and environmental responsibility reforms at select portfolio companies. The City Comptroller serves as the investment advisor to, custodian and trustee of the New York City Pension Funds, collectively valued at $115 billion. The Funds comprise the New York City Employees’ Retirement System, Teachers’ Retirement System, New York City Police Pension Fund, New York City Fire Department Pension Fund, and the Board of Education Retirement System. The New York City Pension Funds hold a combined 1,217,031 total shares in Houston-based KBR Inc. (NYSE: KBR) for an asset value of $34,600,191 as of Dec. 23, 2011. Labels: ", "KBR Inc.", "NYC Comptroller Liu", "NYC Pension Funds", "U.S. Defense Department"
For those that don't know the Bronx has a thriving underground rock community. For more information on the concert and the bands playing please do see the e-mail sent related to the first rock concert of the year, taking place on Friday January 13th. Here is a sampler of one of the bands. First BXUG show of 2012 = Indie, pop-punk, ska, metal, progressive, djent! Let's kick off 2012 right!!! Labels: "A Man, "A Moments Worth", "Bronx Music Trends", "Bronx Underground Rock", "First Lutheran Church of Throggs Neck", "Glyphs of Sionia", "My Arcadia", "What's Your Problem Brian", A Wave"
Here is a video of the famous Garabedian Holiday House in Pelham Gardens. The decorations should stay up past the New Year, so if you have not taken the walk or drive to view the decorations yet, here is what you’re missing. The house is on Pelham Parkway North, east of Eastchester Road. Just drive as if you’re going to Orchard Beach or City Island from the West Bronx. It will be on your left side. Kudos to a Cornell Christianson for uploading the video earlier this month to YouTube and the Garabedian family for continuing their holiday tradition. Labels: "Bronx Christmas House", "Bronx Holiday Decorations", "Christmas 2012 in the Bronx", "Garabedian Christmas House", "Pelham Parkway Christmas House"
I thought the following footage would help spread some holiday cheer. For the first time in the Harlem Meer's history, a floating Christmas tree was installed. Even though the park is not in the Bronx, it's a beautiful image and a possible goal for one of our small park lakes during next years holiday season. The Harlem Meer Christmas Tree from newyorklives.tv on Vimeo. Labels: ", "Blue Saxaphone Films", "Central Park Conservancy Womens Committee", "Charles A. Dana Discovery Center", "Harlem Meer Christmas Tree", "New York Lives TV"
Here is news from our Public Advocate, Bill de Blasio. He recently put out a Christmas tree shopping guide. If you have not purchased your tree yet, please do see the summary of the report and link below. I purchased my tree the other day on Morris Park Avenue between Jacoby and Einstein Hospital. I paid $30 ,inclusive of a $5 tip, for a 6 foot tree that looks great! NEW YORK – This weekend marks a highpoint for Christmas tree sales, and Public Advocate Bill de Blasio has released a bilingual guide with 10 tips to help consumers get the most for their money. Consumer Watch: 10 Tips When Shopping for the Perfect Christmas Tree recommends shoppers survey a wide number of vendors, expect to negotiate over price, and check trees for signs of drying out to be sure they last through the holidays. The guide also urges New Yorkers to use Christmas lights that meet safety standards and to keep trees away from radiators and other heat sources. • Be ready to negotiate. Many vendors have a floor price they are not able to go under, but still list the tree at an inflated price to increase profit margin. They expect you to bargain. • Shop around. Prices will vary dramatically among independent curbside stands, parking lot vendors and major retailers. Local churches and non-profits often have the best deals. • Check for freshness. Bend the outer branches and run them through your fingers. If the branches are brittle or if the needles come off easily, the tree is dried out and won’t last. • Keep it watered. Be sure to get a fresh cut to the tree’s bottom and don't bruise the cut surface on the way home. Otherwise it won’t be able to draw water. • Keep trees away from heat sources. Fireplaces, vents, and radiators can easily dry out trees and increase the risk of fire. • Only use UL-approved lights. The red or green holographic labels signify whether they are safe for outdoor or indoor use. To report holiday-related price gouging, call the Public Advocate’s Constituent Services Hotline: (212) 669-7250. Labels: "Christmas Tree Shopping Guide", "NYC Public Advocate Bill de Blasio"
If you own or operate a small food manufacturing business, please note the following press release sent by Speaker Quinn's office. It contains information pertaining to a new $8 million grant focused on increasing food manufacturing in NYC. As part of our work with the Mayor's Office to help strengthen and grow the City's industrial sector, we are encouraging food manufacturers and other eligible businesses to apply to our $8 million NYC Council Small Manufacturing Investment Fund. New York City was once home to thousands of manufacturing firms and hundreds of thousands of good-paying manufacturing jobs. While we have lost many of these firms and jobs over the last fifty years, we now have the opportunity to capitalize on our resurgent small manufacturing sector and reestablish New York City as the center for 21st century manufacturing. Our Small Manufacturing Investment Fund will help to do this by providing capital for the reactivation and modernization of empty factories into spaces that are well-suited and affordable for small manufacturers. This past week, the New York City Economic Development Corporation (NYCEDC) issued a Request for Proposals (RFP) to renovate existing industrial space in the five boroughs for small manufacturing and related uses. Preference will be given to respondents that meet certain criteria, including those with not-for-profit status and property located in current Industrial Business Zones and Industrial Ombudsman Areas. Awards range from $1 million to $2 million, and the RFP will remain open on a quarterly rolling basis until all funds have been allocated. The first quarter deadline is Tuesday, March 13, 2012. A copy of the RFP is available at www.nycedc.com/rfp. NYCEDC strongly encourages interested respondents to attend one of their information sessions, the first of which will be held on Tuesday, January 31, 2012, at 10 am at 110 William Street in Lower Manhattan. If you would like to attend this session, please RSVP to IndustrialSpaceModernizationRFP@nycedc.com no later than Friday, January 27th. If you have any questions about the RFP or our Small Manufacturing Investment Fund, please feel free to contact Katie Codey in the NYC Council Policy Division at 212-788-9144. She can also be reached by email at kcodey@council.nyc.gov. Labels: "Food Manufacturing", "Katie Codey", "Mayors Office", "NYC Small Manufacturing Fund", "NYCEDC", "RFP"
Here is news about another toy drive that took place earlier today. Kudos to Councilman Cabrera for doing his part to help. I am sure the kids appreciated the gifts. With over 40 percent of Bronx children living below the poverty line and with the 14th Council District being one of the poorest council districts in the City, Councilman Fernando Cabrera hopes to ease tensions for struggling families this Holidays season through providing toys to households in his district. Tomorrow, Councilman Cabrera will visit P.S. 310 to kick off the Holiday Season with 300 toys for some of his youngest constituents. Labels: "14th District", "Counciman Cabrera", "Holiday Cheer", "PS 310"
Prep time might be requested if needed. Their hours are flexible as well, especially for the gym. If any alterations are made, the unit they will be restored to its original condition. Please do e-mail me if interested. Please also note the filmmakers are insured. Labels: "Extra Cash", "Film Locations Needed", "Film Locations", "NYU Film"
Here is information sent by a day care center conducting an open house on Dec 28th. I do not have first hand experience with the day care center but thought the information might be useful to Boogiedown readers with children. Bronx, NY – Tender Tots Child Care Center will host an Open House on Wednesday, December 28, 2011 from 11am to 5pm at the 3322 Decatur Avenue location in the Bronx featuring special educational services. All government subsidy programs such as ACS and HRA will be accepted. If you’re the parents of children ages 0-6 years old and are looking for a clean, safe, nurturing and educational environment, Tender Tots Child Care Center is the place for you and your little ones. Tender Tots provides fun and stimulating childrens' daycare and pre-school services at two beautiful locations in the Bronx and provides quality childcare services to underserviced neighborhoods with a dedicated staff and round-the-clock efforts towards the development of young children. We firmly believe that children should grow and develop in a caring environment that encourages their imaginations to blossom and flourish at this important stage in their lives. At Tender Tots, classes are kept to a low student-teacher ratio and the staff consists of carefully handpicked board of education-certified teachers and instructors to implement music, art, and many other exciting programs. · Infant Program (Ages 0 - 2) - Teachers spend time singing, playing with puppets, and dancing, focusing on primary areas of development and offering a wide variety of motor skill activities. · Toddler Program (Ages 2 - 3) - Gross motor and social skills are developed through both structured and unstructured play. Days are filled with music, art, dance, story times and more. · Preschool (Ages 4 - 5) - Games teach pre-reading skills like phonemic awareness, letter and sound recognition, basic math concepts, and hands-on science exploration. · Kindergarten (Ages 5 - 6) - Mirroring the state curriculum standards, kindergarteners focus on reading, early writing, and basic math. Labels: "ACS", "art", "dancing", "daycare", "HRA", "music", "pre-school", "puppetts", "singing", "story time", "Tender Tots Child Care"
Here is more on NYC Comptroller protecting how are tax dollars are spent. With cost savings like this latest $93 million to out City's IT budget, it’s no wonder he is under attack. NEW YORK, NY – City Comptroller John C. Liu today green-lighted technology contracts after the Department of Information Technology and Telecommunications (DoITT) agreed to a $93 million reduction in the cost of the contracts. This follows six weeks of negotiations between the Comptroller’s office and DoITT. On November 3, 2011, the Mayor’s Office of Contacts (MOCS) approved $290 million in contract extensions for IT services to City agencies. Comptroller Liu had expressed deep concerns about the contracts and said his office would examine them closely once they were submitted. In the weeks since MOCS approval, Comptroller Liu’s office has worked on this issue with DoITT and MOCS, and as a result of these negotiations the agencies agreed to the $93 million cost reduction. DoITT and MOCS also agreed to shorten the contracts’ time frame to 18 months from their original proposals of two years. This is the latest example of contract savings Comptroller Liu’s office has been able to realize for the City’s taxpayers. Working with City Hall, the Comptroller’s office successfully put an end to the runaway spending related to, among other items, CityTime and the Emergency Communications Transformation Project (ECTP). Liu credited Deputy Comptroller Geneith Turnbull and the staff of the Bureau of Contract Administration for securing the cost reductions from MOCS and DoITT. Labels: "DoITT", "Mayor's Office of Contracts", "NYC Comptroller John C. Liu"
Matt Duran and Ray Negron of the NY Yankees, Assemblyman Jeffrey Dinowitz, PS 7 Principal Frank Patterson, Bronx Chamber of Commerce President Lenny Caro, NY Yankees mascot Sultan and puppet Lucky pose with students from PS 7. Assemblyman Jeffrey Dinowitz hands out soccer balls to PS 7 students. Labels: "Bronx Chamber of Commerce", "Frank Patterson", "Holiday Cheer", "Jeffrey Dinowitz", "Lenny Caro", "Matt Duran", "New York Yankees", "PS 7", "Ray Negron", "Yankee Rings"
The tradition continues! If you’re an artist looking to take the world by storm, please read on. The Greene Space is looking for the best undiscovered performers—bands and ensembles of all genres, instrumentalists, vocalists, DJs and spoken word artists—to take part in our third annual celebration of New York City’s up-and-comers. Selected talent will perform in The Greene Space. The winner of the final battle gets a featured concert, a professional photo and video shoot and an iPad package from Tekserve! Rules and more info at thegreenespace.org/battle. Behind the Music: Finotee in The Bronx from The Greene Space @ WNYC & WQXR on Vimeo. 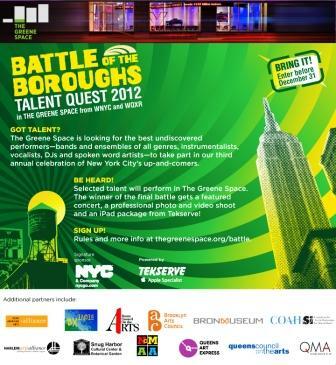 Labels: "2012 battle of the Boroughs" "Talent Quest 2012", "Bronx Council of the Arts", "NYC and Company", "Tekserve", "The Green Space", "WNYC", "WQXR"
Here is a "feel good" post about school children, community organizations and political figures working together to collect canned food and turkeys for the less fortunate in our borough. Kudos to everyone involved. Assemblyman Jeffrey Dinowitz presented the donations from his holiday canned food and turkey drive to Robert Peralta from the Kingsbridge Heights Community Center and Sister Ellen from the St. Francis of Rome Church. The food, which will go to needy families this holiday season, was generously donated by the students of PS 7, the Riverdale Kingsbridge Academy, PS 81, and PS 24. Money for the purchase of turkeys was donated by students and Jim Napolitano of Ben's Market in Knolls Crescent. Labels: "Assemblyman Dinowitz", "Bronx", "Food Drive", "Kingsbridge Community Center", "PS 7", "PS 81", "PS24", "Riverdale Kingsbridge Academy", "Robert Peralta", "Sister Ellen", "St. Francis of Rome Church"
I enjoyed receiving and posting news about the free running events organized by Holiday Marathons right here in the Boogiedown. Unfortunately, the organization has moved it’s free Christmas Marathon, which attracted hundreds of runners last year, to a park in Yonkers due to alleged indifference or possible interference by NYC park bureaucrats. Information related to the event and why Holiday Marathons will take their Christmas run north of the Bronx, can be reviewed below. It’s a shame when we loose quality events like the runs organized by Holiday Marathons. In my opinion, city government let everyone down on this front. Contact numbers to city officials who could possible make a difference on future runs can be found on the links provided. "Sadly the NYC Parks Dept. denied our permit request for Christmas in VC Park and has been imposing unfair rules and regulations upon us. For a list of the antics of the NYC Parks Dept. go to http://www.thechristmasmarathon.com/index.php/nyc-parks-cancels-xmas-2011/ "
Join us for the 2nd Annual Christmas Marathon! Come to run, walk or spread cheer! Tibbett’s Brook Park is one of most majestic and oldest Parks in Westchester County. The Christmas run is FREE but we do accept donations. Please join us in sending a huge thanks to the Westchester County Parks Department, which has been welcoming and supportive. The Holiday Marathons is excited to host a run in Tibbets Brook Park and give back to the community. Please bring an extra gift for the Marine Corps League of Westchester’s Toys for Tots Holiday Drive. We will accept gifts before the run and deliver them for you. Thank you for your support and see you at a run soon! Labels: "2nd Annual Christmas Run", "Christmas Marathon", "Holiday Marathins", "News 12", "NYC Parks Department", "Tibbetts Brook Park", "Van Cortlandt Park"
If you’re a veteran in need of help related to your housing situation, please review the grant information below. The Department of Veterans Affairs recently announced the availability of funding under its Supportive Services for Veterans Families to help homeless veterans and their families. The purpose of the program is to provide support and counseling to very low-income veteran families who are homeless and seeking permanent housing and to those who have housing and are facing financial difficulties. Non-profit organizations and consumer cooperatives are encouraged to apply to provide or coordinate such services. For more information about this grant please visit The Department of Veterans Affairs website. For more information about other federal grants please visit grants.gov. Labels: "Bronx Veterans", "Department of Veteran Affairs", "Homeless Veterans"
Here is a post related to the PAL, along with private and corporate philanthropists, doing their part to make sure NYC children have a gift under their tree this Christmas. Kudos to all the philanthropist, including Bronx raised John Catsimatides. It's good to see a self made immigrant billionaire come back to his roots to spread goodwill. Commissioner Raymond W. Kelly, Party Co-Chair Margo Catsimatidis, PAL Chairman Robert M. Morgenthau, PAL’s Executive Director Alana Sweeny, and PAL Board Member and Party Co-Chair John Catsimatidis join PAL children, staff, members of the NYPD and friends at the Annual Holiday Party. On December 10, 2011, hundreds of boys and girls, ages five to seven from all five boroughs, gathered at the Police Athletic League’s (PAL) Annual Holiday Party at PAL’s Harlem Center, Manhattan Avenue at 119th Street. Young people from PAL’s NewSouth Bronx Center, PS 48 in Hunts Point and PAL’s Webster-Giannone Center in Fordham-Tremont enjoyed a festive holiday party filled with arts and crafts, giant board games, face painting, carnival booths, inflatable rides, goodybags, holiday treats and a visit from Santa and Mrs. Claus. Bronx children enjoyed performances from internationally acclaimed classical/rock violinist Daisy Jopling and clowns from Ringling Bros. and Barnum & Bailey Circus and a visit from Clifford the Big Red Dog™. In addition, talented young dancers, singers, steppers and musicians from PAL centers entertained partygoers with special performances to celebrate the season and provide holiday cheer. Special guests including PAL Honorary President and Police Commissioner Raymond W. Kelly, PAL Chairman Robert M. Morgenthau, PAL President John Osborn, Manhattan District Attorney and PAL Board Member Cyrus R. Vance Jr., and PAL Board Member and Holiday Party Co-Chairs John and Margo Catsimatidis joined PAL children for the holiday extravaganza. On behalf of boys and girls throughout the city, the Police Athletic League thanks the New York City Police Department for participating in PAL Play Streets, youth centers, sporting leagues, summer programs and cultural activities. The celebration was one of many PAL Holiday Parties bringing happiness and toys to thousands of youngsters at PAL centers and police precincts in their own communities. New York City’s Police Athletic League is the first and finest civilian-run PAL in the country. Founded in 1914, PAL has served the city’s young people for 97 years. PAL provides recreational, educational, cultural and social activities to over 50,000 boys and girls annually. It is also the city’s largest, independent, nonprofit youth organization. For more information, please visit www.palnyc.org. The Police Athletic League Annual Holiday Party was made possible by the generosity and holiday spirit of hundreds of caring New Yorkers including John and Margo Catsimatidis, Advantage Sales & Marketing (Bumble Bee and M&M Mars), Bachman, Coca Cola, Crossmark Foods, Dora’s Naturals, Edy’s Ice Cream, ESM Foods, Fairhaven, 4C Iced Tea, Fiji, Flowers Foods (Mrs. Freshley’s cakes), Frito-Lay, G&H International (Duchess cakes), Herr’s Snacks, Hershey, JO’H Metro Foods, Junior Juice, Kraft Foods, Malt-O-Meal Cereal, Nassau Candy, Nestle USA, Quaker, Snapple, Ssips, Twinings Tea, Wakefern and W.B. Brown (Keebler). Volunteers from Capital One Bank, Chartis, Con Edison, HSBC Bank, JP Morgan- Professional Networking Group and MetLife assisted at the celebration. Labels: "Bronx Children", "Comissioner Ray Kelly", "Daisey Joplin", "John Catsimatidis", "Margo Catsimatidis", "NYPD", "PAL", "Police Athletoc League", "Robert Morgenthaul"
If you love Latin music and the spoken word, here is a great selection for ringing in 2012. I could not resist posting the advertisement sent, due to it's location at the Nuyorican Poets Cafe and the headline which includes La Bruja. Not only is La Bruja "Bronx Royalty" she is a talented performer who contributed music to the movie "Gun Hill Road" and took time out of her busy schedule to MC last years first annual Bronx Week Film Festival. Ring in the new year at the Nuyorican Poets Cafe, with a New Years' Eve concert by celebrated Multi-Grammy nominated Latin Jazz percussionist Bobby Sanabria and Quarteto Aché, featuring a special performance by poet/songstress/comedienne La Bruja. Tickets are $25 in advance and $30 at the door (students and Nuyorican members pay only $20 at the door, with valid ID).Tickets include a champagne toast at midnight. The Cafe serves beer, wine, coffee, tea and soft drinks but no food. All ages are welcome at events, but you must be over 21 w/ valid ID to drink. Out of respect for our artists, there is NO video or audio recording of events without prior written permission from Cafe management. The Cafe is wheelchair accessible, but we recommend that you call in advance so that we can accommodate you. Labels: "Bobby Sanabria", "La Bruja", "New Years Eve", "Nuyorican Poets Cafe", The A G Foundation and the National Endowment for the Arts"
Here is some local news related to the restoration of bus shelters by Scott Towers and Bronx HS of Science. If you’re spared a good soaking while waiting at the bus stop, thank Councilman Koppell and DOT's Bronx Commissioner Constance Moran. At the insistence of Council Member Oliver Koppell and others, the city restored the long awaited bus shelter located on Paul Avenue and West 205th Street, across the street from Scott Towers and the Bronx High School of Science, on December 12, 2011. The bus shelter had been removed last May because of the MTA’s installation of an additional protective wall around the BedfordPark train yard. Although the construction was completed, the shelter was not slated to be re-installed until May, 2012. At the request of Scott Tower residents, who contacted Koppell’s office with their concerns about the long delay in restoring the shelter, Koppell sent a letter on October 31, 2011 to Constance Moran, DOT’s Bronx Borough Commissioner, asking for the restoration of the shelter before the weather worsens. At the unveiling of the bus shelter last Monday, Sonia Lappin, President of the Scott Towers Tenants’ Association, and other local residents expressed their delight with the new structure, saying it will provide bus riders with the protection they have been missing. Labels: "Bronx H.S. of Science", "Councilman Koppell", "Paul Ave", "Scott Towers Tenant Association", "Scott Towers", "Sonia Lappin", West 205th St."